Monsieur Lazhar was the big winner Thursday night at the Genie Awards — the heart-warming story about a teacher making a difference in the lives of a middle-school class earned best picture and five other trophies. Director Philippe Falardeau took home best director honours and best adapted screenplay for the story of an Algerian immigrant, his own life full of heartbreak, who steps in to teach a middle-school class after their teacher commits suicide. Monsieur Lazhar was a favourite going into the awards, which were presented in Toronto. The film earned an Oscar nomination earlier this year in the best foreign-language film category. Best supporting actor: A Dangerous Method, Viggo Mortensen. "I want to say that I’m privileged to work in a time and a place where our public system makes it possible for us to make a personal film," Falardeau said after his win for best director. "It is a choice we make as a society. Cinema is the memory and the imagination of a country so without that our country would not be a nation. "I would like to share this with all my fellow filmmakers across the Canada who are struggling to make personal films. I want to say to them be persistent, be wild, be bold, be a little delinquent, take this and something good is bound to happen," he continued. In accepting the screenplay award, Falardeau acknowledge his inspiration, a play by Evelyne de la Chenelière. "Monsieur Lazhar comes from a beautiful play called Bashir Lazhar that I saw four years ago. That night, I didn’t find a subject for my next movie, it found me," he said. Backstage, he spoke about the reactions of immigrants and teachers to the film, saying the bittersweet story has been warmly embraced. 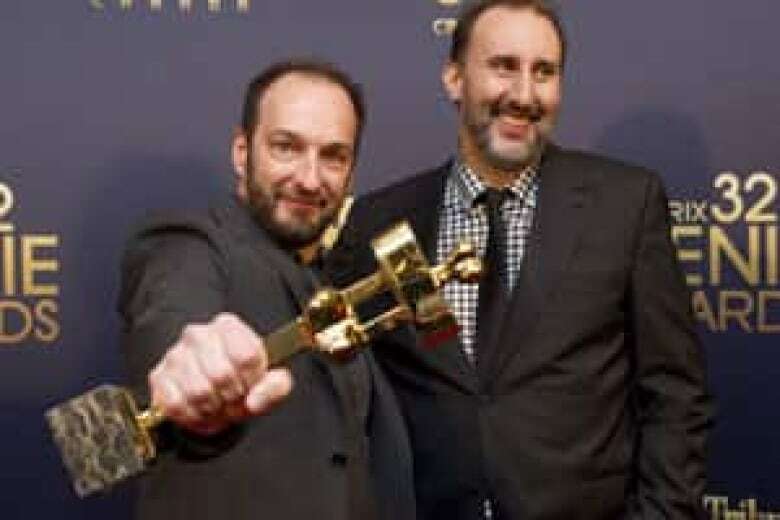 Luc Déry and Kim McCraw, the Montreal producers who backed the film, are the same team who produced Incendies, which won the best picture Genie in 2011. McCraw thanked Falardeau for his "intelligence and his sensibility" but also the families of the many young actors who played the students. Fellag, the Algerian actor who plays the title role of Bashir Lazhar won best actor, but was in France working as a stand-up comic and could not attend. 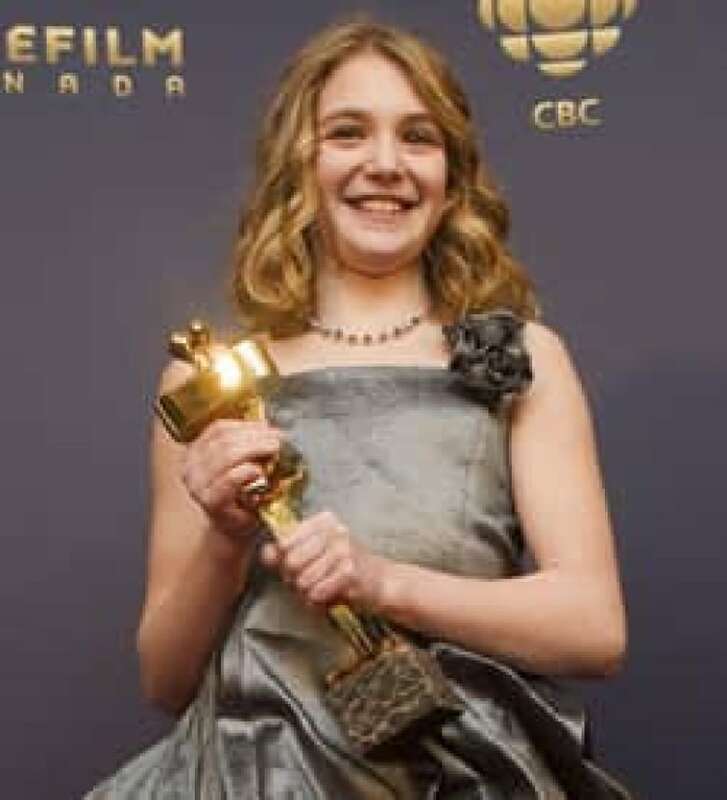 Young star Sophie Nélisse, who was 10 when she played the latch-key kid who can't stop thinking about the death of her previous teacher, took the award for best supporting actress. Nélisse, now 11, becomes the youngest Genie winner since Nina Petronzio won for Vincent and Me in 1991. A Dangerous Method also earned significant recognition, getting five Genies, including best supporting actor for Viggo Mortensen, who played Sigmund Freud in the film about the relationship between Freud and fellow father of contemporary psychoanalysis, Carl Jung. Mortensen, a Habs fan, dedicated his award to the Montreal Canadiens, before wrapping it in a Canadiens flag. "I must thank first and foremost David Cronenberg for taking a chance on me. I don’t think any other director would have thought of me as Sigmund Freud," Mortensen said. Mortensen said he needed a lot of help from his makeup artist to play Sigmund Freud, but once he got used to the amount of dialogue in the film – he and Jung have intense conversations about the direction of psychoanalysis – he was able to relax into the role. "I can talk on film," he quipped on the red carpet, poking fun at the many roles in which he is a man of few words. The sumptuous settings and rich look of the film, which is set in turn of the century Zurich and Vienna, earned a best artistic direction honour for James McAteer. A Dangerous Method also won the awards for best sound, best sound editing and best score, with Hollywood veteran Howard Shore taking the Genie for his original score. Café de Flore, Jean-Marc Vallée’s ambitious romance, had a leading 13 nominations going into the Genie Awards, but had to settle for just three wins. It took best makeup and best visual effects and French actress Vanessa Paradis, playing the mother of a young boy with Down syndrome, took the trophy for best actress. Starbuck, the Ken Scott-directed comedy that was a hit with Canadian audiences, was previously named winner of the Golden Reel for best box office. It also earned best original script for Scott and Martin Petit. "It's very rare that these prizes go to comedies. I’m more than pleased to come here and very surprised," Petit said after the win. Starbuck is the story of a guy who gave to a sperm bank 20 years ago and ended up fathering 533 children, who are suing to discover his identity. Carole Facal’s Quelque part, from Starbuck, was named best original song. The best feature documentary Genie went to At Night, They Dance, the story of a family of Egyptian belly dancers, by Lucie Lambert, Isabelle Lavigne, Stéphane Thibault. The documentary screened at Cannes earlier this year. Best short documentary was Sirmilik, a short by Inuit filmmaker Zacharias Kunuk created for the National Parks Project series. Best live action short was comic drama Doubles with Slight Pepper by Ian Harnarine and Ryan Silbert. The story of a Trinidadian father who returns after a long absence in Canada to the son he left behind is really a story about fatherhood, Harnarine said. "There is not just one story like this, there are many stories," he said backstage after his win. CBC’s George Stroumboulopoulos hosted the awards, with performances by Johnny Reid, K'naan and the Sheepdogs. How Canadian are the Genies in the age of co-production?